It is a disorder that involves chronic inflammation skin that is easily confused with the appearance of acne and can also coexist with it. Usually known as "adult acne." Characterized by a predisposition to eritrosis (redness) in centro facial areas (cheeks, nose, forehead and chin). There are periods of improvement and deterioration. Although the exact cause is unknown, there is some consensus that there is an individual predisposition to developing the disease due to vascular hyperactivity. In some people the blood vessels in the face dilate in response to certain stimuli, which causes facial redness . Drugs: lipid-lowering drugs, niacin, oral and topical corticosteroids. Demodex folliculorum (an aggravating factor). Rosacea is more common in women, and in people of fair complexion and particularly those who blush easily. There is a prevalence of 14% in women and 5% in men, although in these the clinical picture it is a serious case. Rosacea usually occurs between 30-50 years, but can also occur in old age and in childhood. It has a higher occurrence in individuals with fair skin. It is more common in people with seborrheic dermatitis or a history of severe adolescent acne. Arguably seasonal pathology as it is normal to start in spring. It is a temporary redness at first but then becomes persistent with the appearance of telangiectasia (vascular dilation) and sometimes with red bumps and pus (papules and pustules) similar to teenage acne. Many patients with rosacea have an intolerance to certain cosmetics and topical medicines. It usually affects the face, although cases extra facial (trunk and neck), and often there is eye involvement (blepharitis, keratitis, conjunctivitis ... ) that does not correspond to the severity of facial disease. Mainly affects the central part of the face (85%). The predominant areas are the cheeks (87 % ) , and secondly the forehead , chin and nose. Hyper reactivity vascular / vascular disorders. Stays very warmed or sudden temperature changes. Meals and drinks very hot and spicy, fermented cheese and alcohol. Prolonged use of topical corticosteroids. It has been observed that food or drugs that cause facial vasodilation act as triggers, either through the substances contained in them or their ingestion at high temperatures as with coffee. There are also a number of factors that can worsen rosacea as acne vulgaris, seborrheic dermatitis , nicotinic acid, topical steroids, autoimmune diseases and their treatment, and sun exposure. Vascular: Blush recurrent permanent facial redness is persistent and the small vessels of the skin of the face dilate and are marked as red lines on the nose and cheeks (telangiectasia). Inflammatory: Sometimes appears red bumps and pus (papules and pustules ) during evolution. Phymatous: You may see a thickening of the skin on the forehead, chin, cheeks and above all, in the nose, which is red in some men, increases in size and covered with telangiectasias. This is called rinofima or sebaceous nasal hyperplasia. 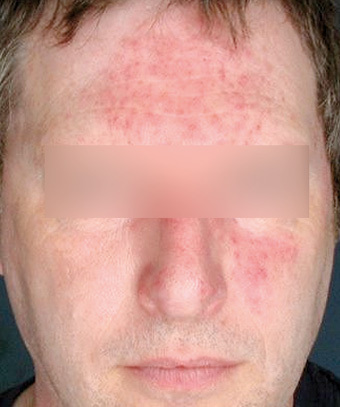 Occular: Approximately 50% of rosacea patients, it may also affect the eyes. These patients experience stinging, dryness, itching, foreign body sensation. There is a swelling around the eyes and telangiectasias appear in the sclera. Prerosacea. At its onset is characterized by flushing or blushing cheeks. Stage I. Progresses in transient facial erythema (blushing) similar to regular blushing or redness, becoming more persistent. Stage II. Exstensive persistent erythema (redness) and vascularity (increased prominence of the blood vessels). Edema. papules and pustules that usually develop with varying intensity over time . It may appear thickened or skin eruptions similar to acne. Stage III. Deep persistent erythema . Presented with tissue hyperplasia, dense telangiectasias, inflammed nodules and growth of the sebaceous glands. Rosacea is chronic and further there worsening episodes. These outbreaks can be treated and controlled if no curative treatments. All treatment if prescribed by a doctor, aims to control symptoms and improve skin appearance. The treatments should be tailored, as each case and each patient are different. There is a consensus that the treatments are often more effective against papules and pustules, and less against the redness of the skin, which is more difficult to remove. When the case is severe, oral retinoids may be resorted to. Sometimes surgery or laser is used to combat or telangeictasias rhinophyma. The patient should use sunscreen with SPF 15 or higher and avoid direct extended sun exposure. It is also advisable not to wash with mild soap and avoid oily cosmetics or those that contain alcohol (cologne, lotion, aftershave). Inhibits 5 -alpha - reductase. Reduces excess sebum on the face and scalp. Inhibits tyrosine and get a uniform color. Antibacterial Action (P. acnes ) , keratolytic and comedolytic. Seboregulating: inhibits 5 -alpha - reductase. Hydrates, soothes and reduces redness. Healing , anti-inflammatory , soothing and anti-irritant. Improves the skin barrier function.